ORS promoted this 80 acre site during the roll-forward of Bedford Borough's First Local Plan which had an end date of 1 January 1996. Whilst the site was not allocated, the Inspector made some positive comments. 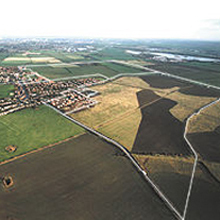 During the roll-forward of the Local Plan to 2001, the Draft Consultation allocated the site for 170 units. Following Pre-Inquiry changes after the Deposit stage ORS persuaded the Local Authority to increase the allocation to 450 dwellings plus a small shopping centre and school site, the allocation has since been increased to 550. Two composite parcels of land which were refused planning permission for 50 units - the site was identified by the Local Authority as open space. After the appeal was allowed, the site was sold to Westbury Homes together with some additional land which had been allocated, creating a total of 86 units. Approximately 5 acres of land which was refused planning permission. ORS succeeded at appeal only to have the application challenged in the High Court by the Local Authority. The challenge was dismissed and the site was subsequently sold by tender to Persimmon Homes. Land owned by the Borough Council. Additional land zoned for 340 dwellings to an existing allocation for 114 dwellings following Pre-Inquiry changes. 1.45 acre site of which 0.9 acres is a carp lake. Planning permission was negotiated over a very long period for one detached house in this very tranquil setting. Selling Agents - Bidwells. ORS is not only interested in large areas of land, we are also keen to become involved in smaller acreages as well. This was a very attractive site, being the residual part of an adjoining site which was granted planning consent on appeal. Planning consent has been achieved for one detached house including a verandah mounted on stilts over the pond!